Scientists at the Chandra X-Ray Observatory have detected a ghost x-ray image around a black hole. 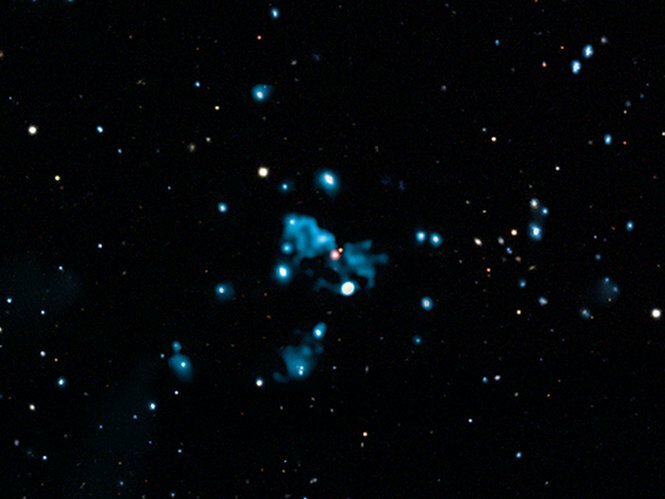 Such ghosts are believed to be remnants of a past explosion from the black hole. Lower energy electrons remaining after the bulk of the higher energy electrons of the initial explosion dissipated interacted with photons in the cosmic microwave background (CMB). The photons bumped the electrons into the x-ray energy range, enabling their detection by Chandra. Run jointly by NASA and Harvard University’s Smithsonian Astrophysical Observatory, Chandra can detect X-Rays 100 times fainter than other X-Ray detectors. The source of the ghost image is HDF 130, located more than 10 billion light years from Earth in the Chandra Deep Field-North observation area. It was previously detected by Chandra a few years ago but scientists failed to come up with an explanation as to what it was at the time. The original explosion occurred about 3 billion years after the Big Bang at a time when black holes were frequently being created. It most likely consisted of ejections of high energy x-rays and radio waves which dissipated after several million years, leaving behind the lower energy electrons which comprise the ghost image. Collisions between those electrons and the CMB photons boosted the electrons into the x-ray energy range, resulting in the remnant detected by Chandra. The detected ghost image is a first of its kind. Other explosions have been previously detected, but only in conjunction with massive radio bursts that indicate the explosions are still ongoing. There are no such radio bursts at HDF 130, just a point source coinciding with an elliptical galaxy seen in optical images. The radio point source identifies the location as the site of a growing supermassive black hole within the galaxy (which agrees with current theories that most galaxies contain such black holes at their center). In addition, the shape of the x-ray source is more consistent with radio jets than a galaxy cluster or other possible sources. 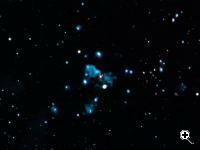 Although this is the first remnant detected, there should be many more if the theory of its origin is correct. A careful attempt to locate more ghost images from black hole explosions could help prove (or disprove) current theories about the number of black holes created in the early universe. TFOT has previously reported on other Chandra discoveries including the accidental discovery of the dustiest binary star system ever seen, the collision of two galaxies as captured by both Chandra and Hubble, the discovery of a supernova only 12 million light years from the solar system, and the observation of a supernova a hundred times more energetic than the typical supernova. Read more about the x-ray ghost in this NASA press release or a similar press release published on the Smithsonian Astrophysical Observatory Chandra site.